The aim of this article is to get you started with basic Nginx web-server installation using the dnf install nginx command and configuration. Nginx web server is an Apache alternative with a capability to be also used as reverse proxy, load balancer, mail proxy and HTTP cache. 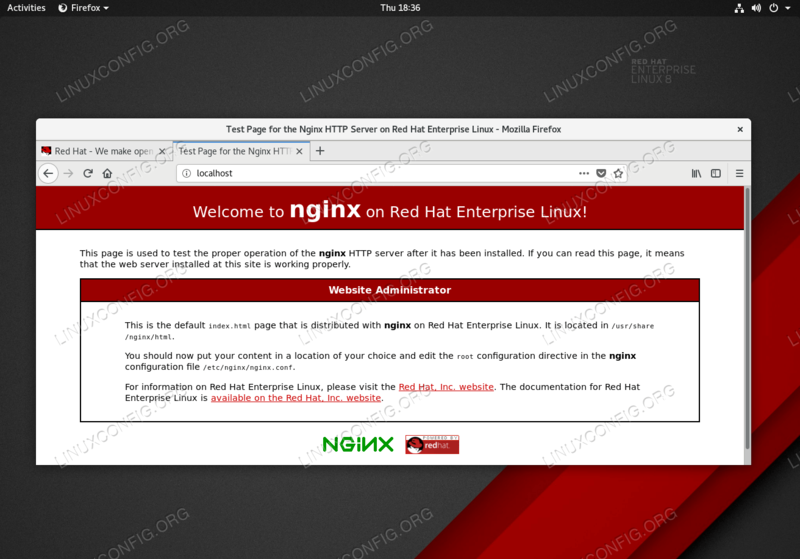 How to install Nginx on RHEL 8. How to enable Nginx to start after reboot. How to open HTTP and HTTPS ports. How to run Nginx encrypted with HTTPS. How to create self-signed SSL certificate for Nginx. Nginx web-server on RHEL 8 Linux server. Install Nginx webserver using the dnf command. Created symlink /etc/systemd/system/multi-user.target.wants/nginx.service → /usr/lib/systemd/system/nginx.service. Access the Nginx welcome page. All should now be ready to access Nginx from a remote host. Open browser and navigate to http://YOURHOSTNAME URL. The default Welcome to nginx web page location path is /usr/share/nginx/html. Access the Nginx welcome page. All should now be ready to access Nginx from a remote host. Open the browser and navigate to https://YOURHOSTNAME URL.